Recent research in psychosocial studies that draws on a theoretical framework of Lacanian psychoanalysis has granted social psychology with a rich understanding of individuals’ investments in discursive subject positions. The Lacanian psychosocial conception of subjectivity considers how multiple paradoxical narratives, conditioned by desire, form a complex subject constituted through discourse. However, this paradigm has yet to produce a psychosocial discursive analysis of subjection via ideological interpellation. This discourse analysis combines psychoanalytic cultural criticism with Lacanian psychosocial studies to produce an analytic methodology. 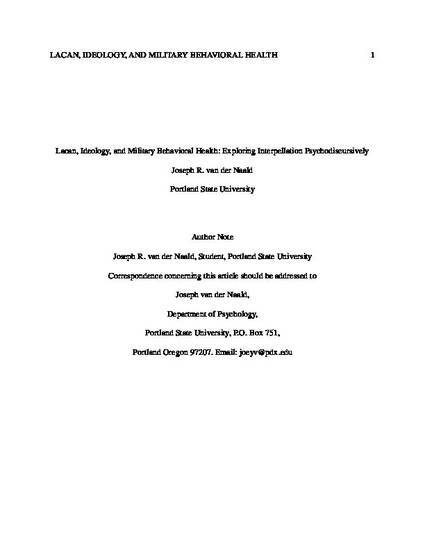 The thesis then employs this methodology to examine a case study of three interview transcripts from Dr. Janice Haaken’s documentary MIND ZONE: Therapists Behind the Front Lines, exploring the discursive practices in the subjectivity construction of ideologically interpellated Combat Stress Control therapists. I show how the interviewee, the Colonel and U.S. Commander of a Combat Stress Control unit in Afghanistan accords with the complex subject of Lacanian psychosocial studies and how the military identity he is both interpellated into and performs depends upon an attachment conditioned by desire. Having demonstrated how the psychoanalytic concept of desire is articulated in the Colonel's discourse, the thesis concludes by suggesting avenues for social change using insights from the Lacanian theory of discourse to critique subjection by ideology.